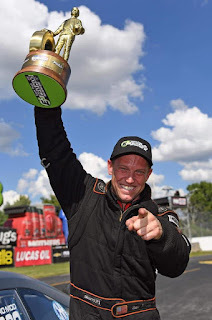 Home > Drag > DragRace > News > NHRA > ProMod > Steve Jackson: Winning Indy has been on my bucket list since I was 9 years old! Steve Jackson: Winning Indy has been on my bucket list since I was 9 years old! We win the 64th annual Chevrolet Performance U.S. NATIONALS! The BIG Go! 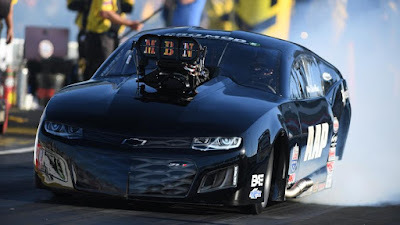 Competing in the ultra competitive NHRA E3 Spark Plugs Pro Mod series has always been a dream of mine. Winning Indy has been on my bucket list since I was 9 years old. This weekend was a storybook tale that absolutely blew me away. We barely got into the field during the final qualifying session, and then marched round by round through some of the toughest cars and best drivers in the world to seize our moment in history. I am amazed by the perseverance and resilience of my team and fans. Since the crash in Charlotte in April, We have worked around the clock, week after week, all while continuing to struggle and fail. The support from our racing community, my team, sponsors, family, and friends have kept us going. It’s the tough times that make you appreciate the successes in life. Bahrain 1 and Sheikh Abdulla have never wavered in there support and encouragement. Phil Shuler has been there through thick and thin, always pushing me and motivating me to be better at my craft. Billy Stocklin is a genius. I truly believe that he is the best at what he does. We he sends me to the starting line, I know we have a hotrod. When me and him are in sync, we are unstoppable! Jack Barbee, Robert Jonsson, Robbie Lowry, Tracy Teasley, Matt Walden, and Ken Crawford sacrifice so much for our team. Y’all keep me bolted together and running. Y’all stand beside me when we fail. You are there when we are dominate. Thank you for your commitment. I have the best crew in motorsports. Thanks to the people and companies that make what I do possible.